Before I even start this there is something I have to get off my chest. I am not a chef. I am not a cook. I am not a kitchen master, baker, nor do I have any training at all, whatsoever in the food preparation department. I will also say I don’t like to cook. Phew, I feel better now. I can now tell you I LOVE to eat. All day, everyday, nom nom nom. I think that’s why I like eating vegetables and fruits so much. Just wash it with my homemade fruit and veggie wash, give it a rinse and done. Food prepared. It’s a total of 2 minutes from when I grab something from the fridge or fruit basket til I am grubbing. Now, that’s efficeint. 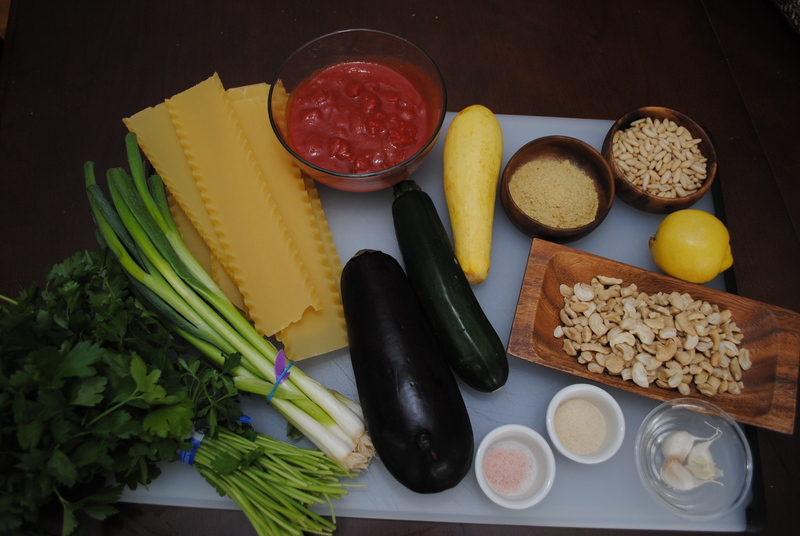 When I accidentally discover create something like this veggie lasagna with what’s left of my produce stash at the end of the week I get really excited to share it with people. I really love when I have people over for dinner and they are scared of what I will put in front of them since I’m always eating something totally foreign to them. Then I plop this lasagna on their plate and a look of relief washes over them. Once they start eating it the compliments roll in and they always include something like….”Oh wow, this is good! I’m surprised you eat stuff like this!” No clue. Once they find out there’s no actual ricotta or meat in it they look totally confused and don’t believe me. Gotcha, suckas! Making meals that start with fresh food is pretty easy and requires minimal effort. I’m not making any complicated sauce or cooking meat to a perfect temperature. I’m chopping veggies and soaking beans and stuff. Cooking plant based meals is really simple. It can easily be vegan by subbing vegan cheese and gluten free by subbing gluten free noodles if either of those things are your jam. I’ve tried it all ways and it’s still good. So, since I don’t really know anything about cooking lingo and etiquette, I apologize if I don’t explain things in a typical way you would expect from a recipe. I’ll explain in a way that’s easy to understand. What I’m trying to say is, if you are a chef or some $h!t like that don’t judge. The “ricotta” portion of this recipe is made from nuts. Yeah, you read that right. Nuts instead of cheese. Cray, right? You’ll see. You will need to soak 1 cup of cashews at least 3 hours to soften them. You will also need a good blender to get the nuts smooth to achieve that ricotta texture. If you have the right blender you will be amazed at what the “ricotta” mixture will look and taste like. If you haven’t already, take a look at the post titled “How to Choose a Blender” if you are in the market for a new one. If you make the ricotta substitute and it’s all chunky, it’s your blenders fault not mine. First prepare the ricotta by adding cashews, pine nuts, lemon juice, onion powder, nutritional yeast, salt, garlic and water to your blender and blend until smooth. 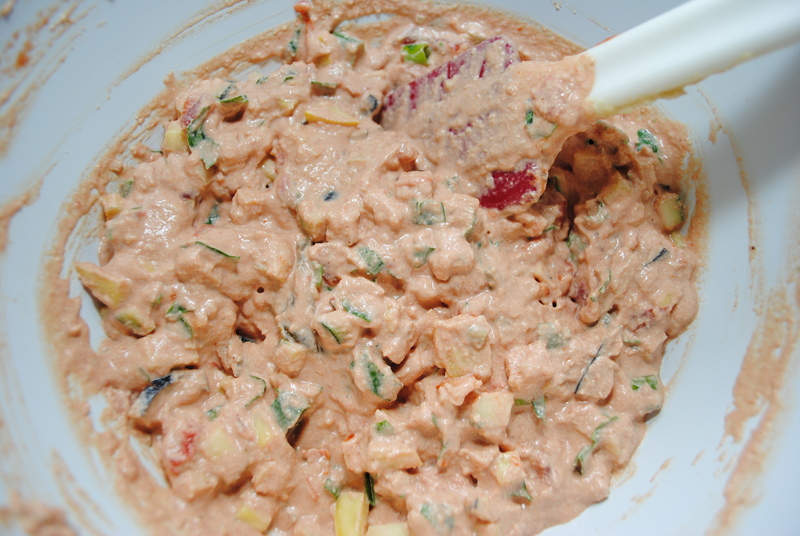 Remove from blender into a large mixing bowl and stir in parsley and green onion. You’ll notice it looks exactly the same as if you mixed regular old ricotta in there. The pink color comes from the tomatoes. 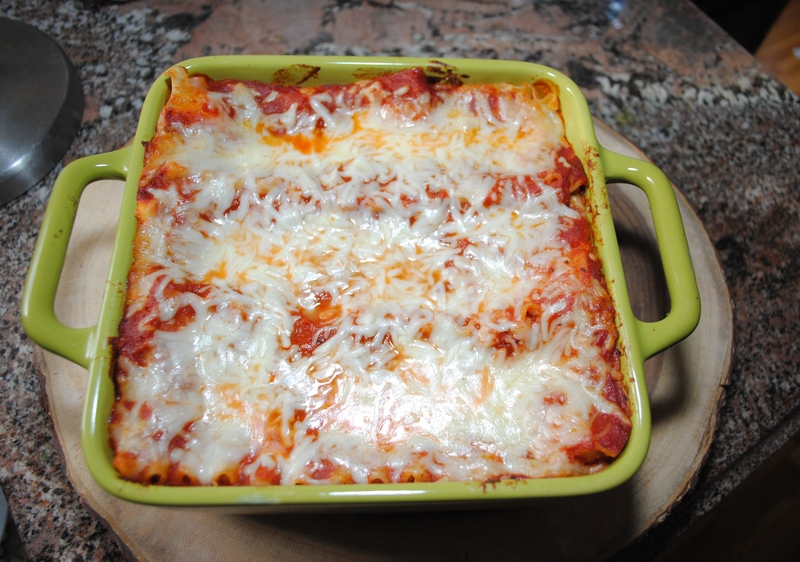 In a 8×8 baking dish, layer, sauce, noodles, and filling. 3 rows of noodles should perfectly fit across dish, just trim off ends if they are too long. Kitchen shears work really well for cutting noodles. 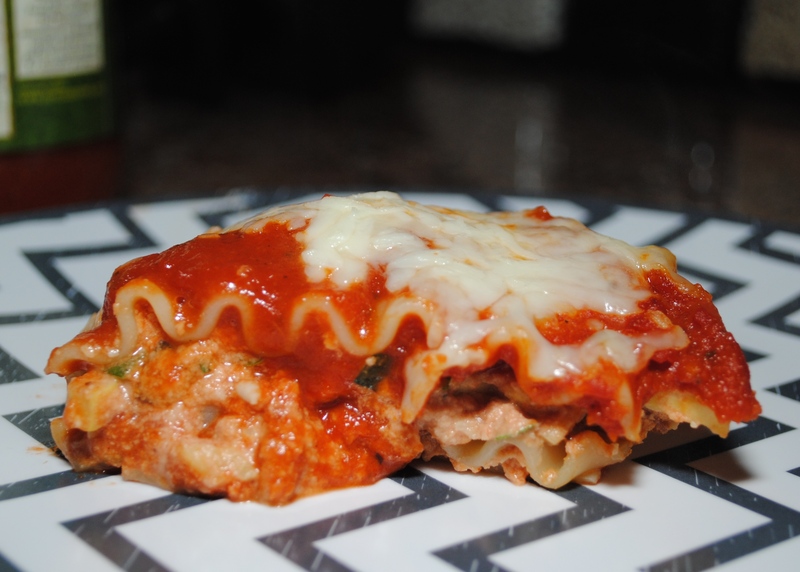 You can fit three layers in dish then top with sauce and shredded mozzarella cheese. Bake covered with tin foil for 30 minutes at 350 degrees. Remove tin foil and continue to bake until cheese is desired doneness, (approx another 10 minutes). I like it when it just starts to bubble. Be sure to check the center of dish for warmth when you take it out of the oven. You want that ish to be really warm. I just shove my finger in there, but if this is for guests you can nudge a noodle over with a butter knife and take a tiny forkful and put the noodle back in place. Let set for about 10 minutes before serving. Once you taste the cashew ricotta you will want to keep stuffing your face with it. It’s also really good spread on toasted bread or crackers and topped with diced tomatoes in a bruschetta type appetizer. Party pleaser!!! Nutritional yeast has a nutty, cheesy flavor and is rich in protein and B vitamins. It is inactive unlike brewers yeast used to make baked goods rise. It’s a really great flavor and works into recipes easily due to it’s flaky texture. It can be found in bulk bins at most health food stores. Raw cashews are so incredibly versatile and when used correctly can be used in place of dairy in tons of recipes. After soaking and blending they have an incredibly smooth cream cheese like texture. Between the cashews, pine nuts, yeast, noodles and vegetables you are getting about 12 grams of protein per serving. So, if you are a member of the protein police you can relax now. Be sure to like greensypants on facebook and follow on twitter so you know when there is more greensypants info to soak in! Share with your friends and the green will keep coming your way! What recipes would you like to see?? ?